Running the bulls in Pamplona. Picking a fight with Holly Holm. Soaring next to a jumbo jet with a rocket and balsa wood strapped on your back. There are many ways to get your death defying rush of blood to the head. But each of these seem to pale in comparison to the acts of those daredevils who annually steel themselves for the greatest feat of bravery known to man. Getting to the front of the Walmart Black Friday line. We all know the score by now: it starts with a shaky handheld camera angle from inside what appears to be a normal store. But slowly and surely, the shutters are opening… as it raises by a foot, the first thing we see is a hand, reaching blindly into our safe haven. It’s followed by an arm, then a shoulder, then a head. Someone is scrambling under the opening door… but they aren’t alone. There are more of them. And they are coming right for you (in this case “you” are a discounted flat screen TV). The home entertainment aisle in Walmart last year. It ends like a scene from Mad Max, the victors parading their spoils on heaving shopping carts, whooping into the wind like Vikings. The losers, those who’ve only been able to get hold of a curling iron with 10% off, skulk away to lick their wounds muttering “never again”. And this viral horde is spreading. Last year there were reports of Black Friday riots in London, Paris and Berlin. It doesn’t even seem like the retailers can halt the flow. — Paula Nickolds, Commercial Director, John Lewis. But what of the challenger brand? What do they do on Black Friday, this hallowed day of commerce? Well, there’s no one answer as you would expect, but we thought we’d highlight some of the best examples we’ve seen. 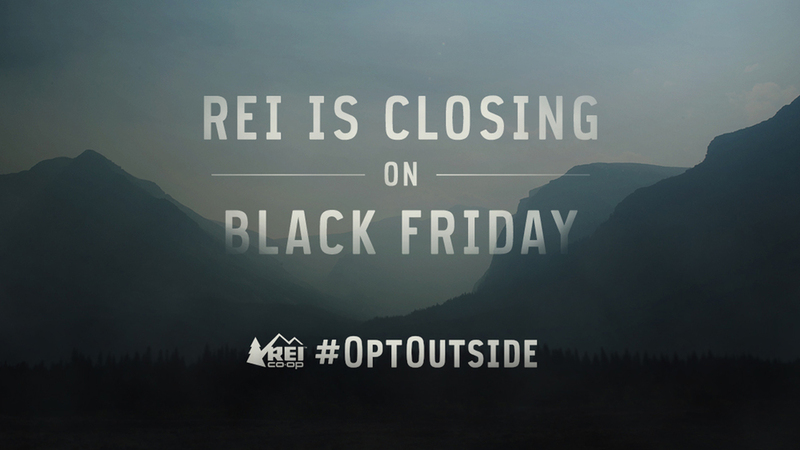 Eco-friendly outdoor supply company, REI, has chosen to shut its doors… It will not take part in the national festival of commerce, choosing to miss out on the potential for increased sales. Why? Because it doesn’t match REI’s beliefs. At eatbigfish, we call this “projecting your lighthouse identity,” with REI using the opportunity to help the world to see what it really stands for. REI wants you to be a part of it too, by getting out into the wilds and tagging your photos with the hashtag #OptOutside. This will be helped no end by the subsequent announcement that seven states will be opening the gates to their national parks free of charge on Black Friday, with Californians promised “the best bargain you’re going to find this Black Friday”. Elsewhere Paddy Power, the European bookmakers and enfant terrible have launched their “Green Friday” sale. Paddy Power claims that they don’t have “old useless stock” that they are desperate to sell off, but they are using the enhanced media attention on the day as an opportunity to flag up a day of enhanced odds. No challenger passes up an opportunity for free publicity, least of all Paddy Power. In their eyes, everything is ripe for mocking. For those that aren’t keen on the trip to the stores, there is a startup that will bring the trip to you. Eaze Solutions LLC, distributors of medicinal marijuana in California, are offering up to a 77% discount on deliveries of weed infused snacks and treats over the Thanksgiving holiday. Quite the relief for any Californians looking to relax after a long time spent with family members. While the major retailers rumble, the Booksellers Association’s over 100 independent stores across the country will be holding special events to offer “peace and tranquillity” to those who want to recuperate and perhaps nurse wounds, where book sales will be accompanied by book readings, teas and the odd glass of bubbly. How ever you choose to approach Black Friday, what we can see from each of these examples is how challengers frequently use the world around them, and the buzz surrounding entities larger than themselves, to define themselves, stating clearly through their actions what they care about and what they feel is important. Wishing a civilised, raucous, chilled or outdoorsy Thanksgiving to our readers in the USA, and a successful run in the sales for everyone else.